The galaxy NGC 4151 is farther away than we first thought. NGC 4151, a spiral galaxy that’s farther away than we first thought. Oooo, what a pretty galaxy! That’s NGC 4151, a spiral galaxy in the constellation of Canes Venatici. This image was taken by my friend Adam Block using the 81 cm Schulman Telescope at the Mount Lemmon SkyCenter in Arizona. It’s an amazing 20 hour exposure! And oh my yes, you want to see the full-res version. It’s a stunner. 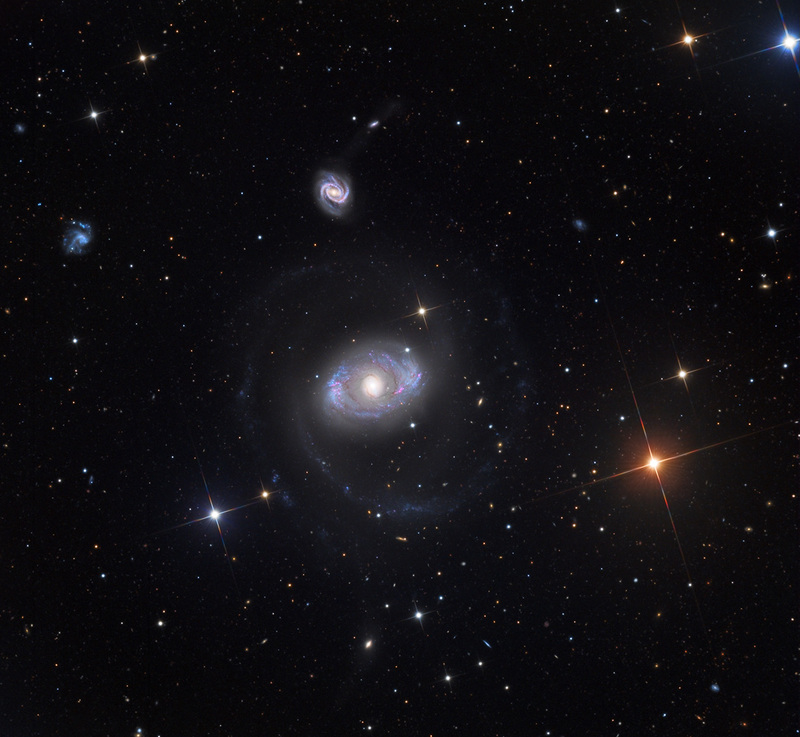 As you can see though, as beautiful as it is, NGC 4151 is a bit odd. It has far-flung and faint spiral arms, but also a brighter ring of stars and gas closer to the center. The ring is blue, indicating the presence of lots of hot, young, massive stars; these blast out bluer light than the Sun does, and at much higher rates, making their existence clear. NGC 4151 is one of the closest galaxies in the Universe with an actively feeding black hole in its center. As far as we know, all big galaxies have a supermassive black hole at their hearts, ranging from millions to billions of times the Sun’s mass. But most are quiescent, dark. Some, though, have material falling into them. This stuff piles up around the hole, forming a flat disk called an accretion disk. The material in the disk can get very hot, and also very bright. So, while the black hole itself is dark, that material can be so bright it can make the galaxy visible clear across the Universe. 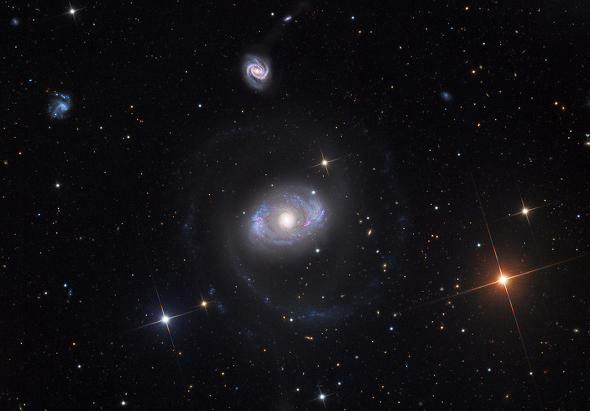 So how far away is NGC 4151? Most catalogs list it as roughly 40 million light-years away. But a paper from 2014 shows that it’s much farther than that: more like 60 million light-years! The new study used a nifty technique, called echo mapping. When matter falls into the black hole, it is not always a smooth flow. A star can fall in, or a big clump of material. When that happens, a flare of high-energy light is emitted. This can light up the disk of material around the black hole, but there’s a delay in how long it takes the disk to brighten because of the huge distances involved; it takes time for the light to reach it. By carefully measuring the time it takes for the disk to respond to a flare, and comparing that with the measured size of the disk, the distance to the galaxy can be found. The new measurement of 62 million light-years looks pretty good. The old measurements are based on things like the galaxy’s redshift, and that can be misleading for nearby galaxies (if it’s in a cluster, for example, it can be moving rapidly and mess up the redshift measurements). Apparently, something like that is the case here, and NGC 4151 is half again farther away than we thought. I find it rather humbling that we are still figuring out the distances to even nearby galaxies. Sometimes we have a lot of confidence in the distance, and other times we’re off by a factor of 50 percent or more. It’s a good reminder that we need to be careful about such things. But at the same time, it’s astonishing that we can measure the distances to galaxies at all! Even nearby galaxies are so far away that the light we see left them when humans barely existed, and for many we see light so ancient the Earth itself hadn’t formed when they sent their photons our way. And yet, despite distances so terrible they crush our sense of scale, we can still get a decent measurement just how large that distance is. I love that we’re so curious as a species that we want to find out answers to questions like these: How far away are galaxies? Why are they shaped the way they are? How are they formed, how do they age, how do they die? Why do they all have monster black holes in their cores? And what I love more: We can figure the answers out! Not bad, for a bunch of evolved apes. Not bad at all.